Remember Brenda Novak’s Online Auction for Diabetes Research? It’s over now–they had a stellar auction, broke records and raised a smashing amount of money for diabetes research. Yay! Yesterday in the mail, I received the auction item I bid on–and it was pretty stellar, too! Inspired by her life in Ireland, Nikki Weston created this beautiful hand-calligraphy saying in both Gaelic and English. The Gaelic language has for centuries captured the hearts and minds of many. An teanga gaelach is rich, vibrant, and spoken daily by many thousands of people on the island of Ireland. 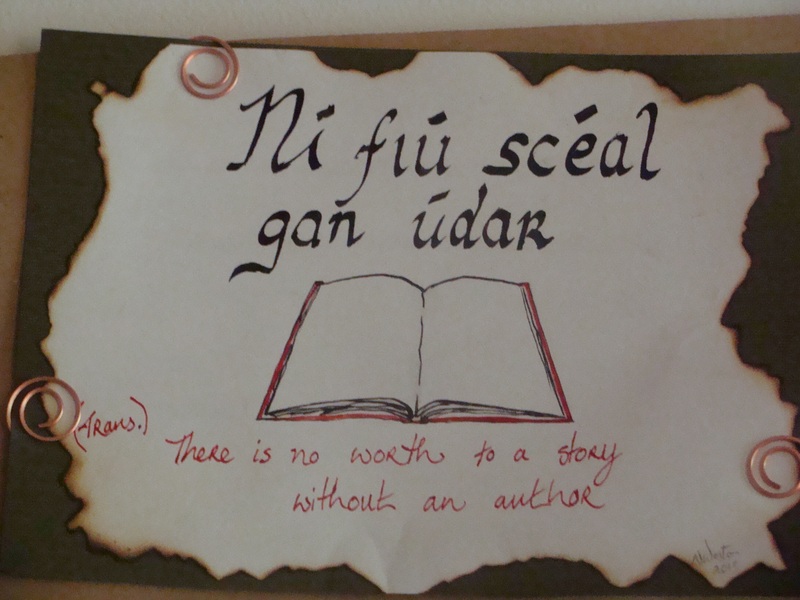 Gaelic lends itself to creating many a wise saying, or seanfhocail. Seanfhocail literally means ‘old words’. In days gone by, the working classes of Ireland fused philosophy with good humour during storytelling or educating their children, and it was there that seanfhocail were born. Having been passed down through the generations, these proverbs are just as apt today and are calligraphed attractively for your enjoyment. Each piece is painstakingly hand-produced using Winsor and Newton calligraphy nibs and inks by writer and artist Nikki Weston. I was thrilled to have the winning bid on this item! It was a lovely way to help fund diabetes research (and honor my big brother). And the saying called to my writer heart as well as the wee bit of Irish in my blood. Plus, I love the connectedness (is that a word? I’m going to say it is) of it all. There was Nikki, all the way over in Ireland, creating and lending her talents to Brenda Novak’s auction, and here was I, all the way down South in the USA, in my little corner office, checking out items and bidding away. It’s a small (and lovely) world, after all. ← Blogging a Book: Well Done, Aspie Writer! Big congratulations! It’s beautiful. I was outbid on everything I was interested in. I didn’t see this awesome calligraphy. Nice! Congratulations on your winning bid. The calligraphy is lovely, and the saying is so true. I was outbid on everything I bid on, but I’m happy the auction was such a success.